Not to be confused with insomnia. Delayed sleep phase disorder (DSPD), more often known as delayed sleep phase syndrome and also as delayed sleep–wake phase disorder, is a chronic dysregulation of a person's circadian rhythm (biological clock), compared to those of the general population and societal norms. The disorder affects the timing of sleep, peak period of alertness, the core body temperature rhythm, and hormonal and other daily cycles. People with DSPD generally fall asleep some hours after midnight and have difficulty waking up in the morning. People with DSPD probably have a circadian period significantly longer than 24 hours. Depending on the severity, the symptoms can be managed to a greater or lesser degree, but no cure is known, and research suggests a genetic origin for the disorder. Affected people often report that while they do not get to sleep until the early morning, they do fall asleep around the same time every day. Unless they have another sleep disorder such as sleep apnea in addition to DSPD, patients can sleep well and have a normal need for sleep. However, they find it very difficult to wake up in time for a typical school or work day. 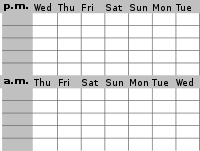 If they are allowed to follow their own schedules, e.g. sleeping from 4:00 am to 1:00 pm, their sleep is improved and they may not experience excessive daytime sleepiness. Attempting to force oneself onto daytime society's schedule with DSPD has been compared to constantly living with jet lag; DSPD has, in fact, been referred to as "social jet lag". Researchers in 2017 linked DSPD to at least one genetic mutation. The syndrome usually develops in early childhood or adolescence. An adolescent version may disappear in late adolescence or early adulthood; otherwise, DSPD is a lifelong condition. The best estimate of prevalence among adults is 0.13–0.17% (1 in 600). Prevalence among adolescents is as much as 7–16%. DSPD was first formally described in 1981 by Elliot D. Weitzman and others at Montefiore Medical Center. It is responsible for 7–13% of patient complaints of chronic insomnia. However, since many doctors are unfamiliar with the condition, it often goes untreated or is treated inappropriately; DSPD is often misdiagnosed as primary insomnia or as a psychiatric condition. DSPD can be treated or helped in some cases by careful daily sleep practices, morning light therapy, evening dark therapy, earlier exercise and meal times, and medications such as melatonin and modafinil; the former is a natural neurohormone partly responsible for the human body clock. At its most severe and inflexible, DSPD is a disability. A chief difficulty of treating DSPD is in maintaining an earlier schedule after it has been established, as the patient's body has a strong tendency to reset the sleeping schedule to its intrinsic late times. People with DSPD may improve their quality of life by choosing careers that allow late sleeping times, rather than forcing themselves to follow a conventional 9-to-5 work schedule. Although some degree of psychopathology is present in about half of adult patients with DSPD, there appears to be no particular psychiatric diagnostic category into which these patients fall. Psychopathology is not particularly more common in DSPD patients compared to patients with other forms of "insomnia." ... Whether DSPD results directly in clinical depression, or vice versa, is unknown, but many patients express considerable despair and hopelessness over sleeping normally again. A direct neurochemical relationship between sleep mechanisms and depression is another possibility. DSPD may cause excessive or inappropriate production of melatonin. Serotonin, a mood regulator, is the precursor of melatonin. As a result, increased endogenous melatonin production can deplete serotonin levels and may cause depression. there may be behaviorally-mediated mechanisms for comorbidity between DSPD and depression. For example, the lateness of DSPD cases and their unusual hours may lead to social opprobrium and rejection, which might be depressing. The fact that half of DSPD patients are not depressed indicates that DSPD is not merely a symptom of depression. Sleep researcher Michael Terman has suggested that those who follow their internal circadian clocks may be less likely to suffer from depression than those trying to live on a different schedule. DSPD patients who also suffer from depression may be best served by seeking treatment for both problems. There is some evidence[clarification needed] that effectively treating DSPD can improve the patient's mood and make antidepressants more effective. Vitamin D deficiency has been linked to depression. As it is a condition which comes from lack of exposure to sunlight, anyone who does not get enough sunlight exposure during daylight hours (about 20 to 30 minutes three times a week, depending on skin tone, latitude, and the time of year) could be at risk, without adequate dietary sources or supplements. DSPD is genetically linked to attention deficit hyperactivity disorder by findings of polymorphism in genes in common between those apparently involved in ADHD and those involved in the circadian rhythm and a high proportion of DSPD among those with ADHD. Persons with obsessive–compulsive disorder are also diagnosed with DSPD at a much higher rate than the general public. DSPD is a disorder of the body's timing system—the biological clock. Individuals with DSPD might have an unusually long circadian cycle, might have a reduced response to the resetting effect of daylight on the body clock, and/or may respond overly to the delaying effects of evening light and too little to the advancing effect of light earlier in the day. In support of the increased sensitivity to evening light hypothesis, "the percentage of melatonin suppression by a bright light stimulus of 1,000 lux administered 2 hours prior to the melatonin peak has been reported to be greater in 15 DSPD patients than in 15 controls." People with normal circadian systems can generally fall asleep quickly at night if they slept too little the night before. Falling asleep earlier will in turn automatically help to advance their circadian clocks due to decreased light exposure in the evening. In contrast, people with DSPD have difficulty falling asleep before their usual sleep time, even if they are sleep-deprived. Sleep deprivation does not reset the circadian clock of DSPD patients, as it does with normal people. People with the disorder who try to live on a normal schedule cannot fall asleep at a "reasonable" hour and have extreme difficulty waking because their biological clocks are not in phase with that schedule. Non-DSPD people who do not adjust well to working a night shift have similar symptoms (diagnosed as shift-work sleep disorder). In most cases, it is not known what causes the abnormality in the biological clocks of DSPD patients. DSPD tends to run in families, and a growing body of evidence suggests that the problem is associated with the hPer3 (human period 3) gene and CRY1 gene. There have been several documented cases of DSPD and non-24-hour sleep–wake disorder developing after traumatic head injury. There have been cases of DSPD developing into non-24-hour sleep–wake disorder, a severe and debilitating disorder in which the individual sleeps later each day. DSPD is diagnosed by a clinical interview, actigraphic monitoring, and/or a sleep diary kept by the patient for at least two weeks. When polysomnography is also used, it is primarily for the purpose of ruling out other disorders such as narcolepsy or sleep apnea. If a person can adjust to a normal daytime schedule on her/his own, with just the help of alarm clocks and will-power, the diagnosis is not given. DSPD is frequently misdiagnosed or dismissed. It has been named as one of the sleep disorders most commonly misdiagnosed as a primary psychiatric disorder. DSPD is often confused with: psychophysiological insomnia; depression; psychiatric disorders such as schizophrenia, ADHD or ADD; other sleep disorders; or school refusal. Practitioners of sleep medicine point out the dismally low rate of accurate diagnosis of the disorder, and have often asked for better physician education on sleep disorders. The major feature of these disorders is a misalignment between the patient's sleep-wake pattern and the pattern that is desired or regarded as the societal norm... In most circadian rhythm sleep disorders, the underlying problem is that the patient cannot sleep when sleep is desired, needed or expected. An intractable delay in the phase of the major sleep period occurs in relation to the desired clock time, as evidenced by a chronic or recurrent (for at least three months) complaint of inability to fall asleep at a desired conventional clock time together with the inability to awaken at a desired and socially acceptable time. When not required to maintain a strict schedule, patients exhibit improved sleep quality and duration for their age and maintain a delayed phase of entrainment to local time. Patients have little or no reported difficulty in maintaining sleep once sleep has begun. Patients have a relatively severe to absolute inability to advance the sleep phase to earlier hours by enforcing conventional sleep and wake times. Sleep–wake logs and/or actigraphy monitoring for at least two weeks document a consistent habitual pattern of sleep onsets, usually later than 2 am, and lengthy sleeps. Occasional noncircadian days may occur (i.e., sleep is "skipped" for an entire day and night plus some portion of the following day), followed by a sleep period lasting 12 to 18 hours. If one of the following laboratory methods is used, it must demonstrate a significant delay in the timing of the habitual sleep period: 1) 24-hour polysomnographic monitoring (or two consecutive nights of polysomnography and an intervening multiple sleep latency test), 2) Continuous temperature monitoring showing that the time of the absolute temperature nadir is delayed into the second half of the habitual (delayed) sleep episode. Mild: Two-hour delay (relative to the desired sleep time) associated with little or mild impairment of social or occupational functioning. Moderate: Three-hour delay associated with moderate impairment. Severe: Four-hour delay associated with severe impairment. People with DSPD have at least a normal—and often much greater than normal—ability to sleep during the morning, and sometimes in the afternoon as well. In contrast, those with chronic insomnia do not find it much easier to sleep during the morning than at night. People with DSPD fall asleep at more or less the same time every night, and sleep comes quite rapidly if the person goes to bed near the time he or she usually falls asleep. Young children with DSPD resist going to bed before they are sleepy, but the bedtime struggles disappear if they are allowed to stay up until the time they usually fall asleep. DSPD patients usually sleep well and regularly when they can follow their own sleep schedule, e.g., on weekends and during vacations. DSPD is a chronic condition. Symptoms must have been present for at least three months before a diagnosis of DSPD can be made. Often people with DSPD manage only a few hours sleep per night during the working week, then compensate by sleeping until the afternoon on weekends. Sleeping late on weekends, and/or taking long naps during the day, may give people with DSPD relief from daytime sleepiness but may also perpetuate the late sleep phase. People with DSPD can be called "night owls". They feel most alert and say they function best and are most creative in the evening and at night. People with DSPD cannot simply force themselves to sleep early. They may toss and turn for hours in bed, and sometimes not sleep at all, before reporting to work or school. Less-extreme and more-flexible night owls are within the normal chronotype spectrum. By the time those who have DSPD seek medical help, they usually have tried many times to change their sleeping schedule. Failed tactics to sleep at earlier times may include maintaining proper sleep hygiene, relaxation techniques, early bedtimes, hypnosis, alcohol, sleeping pills, dull reading, and home remedies. DSPD patients who have tried using sedatives at night often report that the medication makes them feel tired or relaxed, but that it fails to induce sleep. They often have asked family members to help wake them in the morning, or they have used multiple alarm clocks. As the disorder occurs in childhood and is most common in adolescence, it is often the patient's parents who initiate seeking help, after great difficulty waking their child in time for school. The current formal name established in the third edition of the International Classification of Sleep Disorders (ICSD-3) is delayed sleep-wake phase disorder. Earlier, and still common, names include delayed sleep phase disorder (DSPD), delayed sleep phase syndrome (DSPS), and circadian rhythm sleep disorder, delayed sleep phase type (DSPT). Treatment, a set of management techniques, is specific to DSPD. It is different from treatment of insomnia, and recognizes the patients' ability to sleep well on their own schedules, while addressing the timing problem. Success, if any, may be partial; for example, a patient who normally awakens at noon may only attain a wake time of 10 or 10:30 with treatment and follow-up. Being consistent with the treatment is paramount. Before starting DSPD treatment, patients are often asked to spend at least a week sleeping regularly, without napping, at the times when the patient is most comfortable. It is important for patients to start treatment well-rested. One treatment strategy is light therapy (phototherapy), with either a bright white lamp providing 10,000 lux at a specified distance from the eyes or a wearable LED device providing 350–550 lux at a shorter distance. Sunlight can also be used. The light is typically timed for 30–90 minutes at the patient's usual time of spontaneous awakening, or shortly before (but not long before), which is in accordance with the phase response curve (PRC) for light. Only experimentation, preferably with specialist help, will show how great an advance is possible and comfortable. For maintenance, some patients must continue the treatment indefinitely; some may reduce the daily treatment to 15 minutes; others may use the lamp, for example, just a few days a week or just every third week. Whether the treatment is successful is highly individual. Light therapy generally requires adding some extra time to the patient's morning routine. Patients with a family history of macular degeneration are advised to consult with an eye doctor. The use of exogenous melatonin administration (see below) in conjunction with light therapy is common. Light restriction in the evening, sometimes called darkness therapy or scototherapy, is another treatment strategy. Just as bright light upon awakening should advance one's sleep phase, bright light in the evening and night delays it (see the PRC). It is suspected that DSPD patients may be overly sensitive to evening light. Thus, one might be advised to keep lights and computer screens dim for the last hours before bedtime and even wear amber-colored (blue-blocking) goggles. The photopigment of the retinal photosensitive ganglion cells, melanopsin, is excited by light mainly in the blue portion of the visible spectrum (absorption peaks at ~480 nanometers). A formerly popular treatment, phase delay chronotherapy, is intended to reset the circadian clock by manipulating bedtimes. It consists of going to bed two or more hours later each day for several days until the desired bedtime is reached, and it often must be repeated every few weeks or months to maintain results. Its safety is uncertain, notably because it has led to the development of non-24-hour sleep-wake rhythm disorder, a much more severe disorder. A modified chronotherapy is called controlled sleep deprivation with phase advance, SDPA. One stays awake one whole night and day, then goes to bed 90 minutes earlier than usual and maintains the new bedtime for a week. This process is repeated weekly until the desired bedtime is reached. Earlier exercise and meal times can also help promote earlier sleep times. Melatonin taken an hour or so before the usual bedtime may induce sleepiness. Taken this late, it does not, of itself, affect circadian rhythms, but a decrease in exposure to light in the evening is helpful in establishing an earlier pattern. In accordance with its phase response curve (PRC), a very small dose of melatonin can also, or instead, be taken some hours earlier as an aid to resetting the body clock; it must then be small enough not to induce excessive sleepiness. Side effects of melatonin may include sleep disturbance, nightmares, daytime sleepiness, and depression, though the current tendency to use lower doses has decreased such complaints. Large doses of melatonin can even be counterproductive: Lewy et al. provide support to "the idea that too much melatonin may spill over onto the wrong zone of the melatonin phase-response curve." The long-term effects of melatonin administration have not been examined. In some countries, the hormone is available only by prescription or not at all. In the United States and Canada, melatonin is on the shelf of most pharmacies and herbal stores. The prescription drug Rozerem (ramelteon) is a melatonin analogue that selectively binds to the melatonin MT1 and MT2 receptors and, hence, has the possibility of being effective in the treatment of DSPD. A review by the US Department of Health and Human Services found little difference between melatonin and placebo for most primary and secondary sleep disorders. The one exception, where melatonin is effective, is the "circadian abnormality" DSPD. Another systematic review found inconsistent evidence for the efficacy of melatonin in treating DSPD in adults, and noted that it was difficult to draw conclusions about its efficacy because many recent studies on the subject were uncontrolled. Modafinil (brand name Provigil) is a stimulant approved in the US for treatment of shift-work sleep disorder, which shares some characteristics with DSPD. A number of clinicians prescribe it for DSPD patients, as it may improve a sleep-deprived patient's ability to function adequately during socially desirable hours. It is generally not recommended to take modafinil after noon; modafinil is a relatively long-acting drug with a half-life of 15 hours, and taking it during the later part of the day can make it harder to fall asleep at bedtime. Vitamin B12 was, in the 1990s, suggested as a remedy for DSPD, and is still recommended by some sources. Several case reports were published. However, a review for the American Academy of Sleep Medicine in 2007 concluded that no benefit was seen from this treatment. A strict schedule and good sleep hygiene are essential in maintaining any good effects of treatment. With treatment, some people with mild DSPD may sleep and function well with an earlier sleep schedule. Caffeine and other stimulant drugs to keep a person awake during the day may not be necessary and should be avoided in the afternoon and evening, in accordance with good sleep hygiene. A chief difficulty of treating DSPD is in maintaining an earlier schedule after it has been established. Inevitable events of normal life, such as staying up late for a celebration or deadline, or having to stay in bed with an illness, tend to reset the sleeping schedule to its intrinsic late times. Long-term success rates of treatment have seldom been evaluated. However, experienced clinicians acknowledge that DSPD is extremely difficult to treat. One study of 61 DSPD patients, with average sleep onset at about 3:00 am and average waking time of about 11:30 am, was followed with questionnaires to the subjects after a year. Good effect was seen during the six-week treatment with a large daily dose of melatonin. Follow-up showed that over 90% had relapsed to pre-treatment sleeping patterns within the year, 29% reporting that the relapse occurred within one week. The mild cases retained changes significantly longer than the severe cases. Working the evening or night shift, or working at home, makes DSPD less of an obstacle for some. Many of these people do not describe their pattern as a "disorder". Some DSPD individuals nap, even taking 4–5 hours of sleep in the morning and 4–5 in the evening. DSPD-friendly careers can include security work, the entertainment industry, hospitality work in restaurants, theaters, hotels or bars, call center work, manufacturing, emergency medicine, commercial cleaning, taxi or truck driving, the media, and freelance writing, translation, IT work, or medical transcription. Some other careers that have an emphasis on early morning work hours, such as bakers, coffee baristas, pilots and flight crews, teachers, mail carriers, waste collection, and farming, can be particularly difficult for people who naturally sleep later than is typical. Some careers, such as over-the-road truck drivers, firefighters, law enforcement, nursing, can be suitable for both people with delayed sleep phase syndrome and people with the opposite condition, advanced sleep phase disorder, as these workers are needed both very early in the morning and also late at night. Some people with the disorder are unable to adapt to earlier sleeping times, even after many years of treatment. Sleep researchers Dagan and Abadi have proposed that the existence of untreatable cases of DSPD be formally recognized as a "sleep-wake schedule disorder (SWSD) disability", an invisible disability. Rehabilitation for DSPD patients includes acceptance of the condition and choosing a career that allows late sleeping times or running a home business with flexible hours. In a few schools and universities, students with DSPD have been able to arrange to take exams at times of day when their concentration levels may be good. Patients suffering from SWSD disability should be encouraged to accept the fact that they suffer from a permanent disability, and that their quality of life can only be improved if they are willing to undergo rehabilitation. It is imperative that physicians recognize the medical condition of SWSD disability in their patients and bring it to the notice of the public institutions responsible for vocational and social rehabilitation. In the United States, the Americans with Disabilities Act requires that employers make reasonable accommodations for employees with sleeping disorders. In the case of DSPD, this may require that the employer accommodate later working hours for jobs normally performed on a "9 to 5" work schedule. The statute defines "disability" as a "physical or mental impairment that substantially limits one or more major life activities", and Section 12102(2)(a) itemizes sleeping as a "major life activity". Lack of public awareness of the disorder contributes to the difficulties experienced by people with DSPD, who are commonly stereotyped as undisciplined or lazy. Parents may be chastised for not giving their children acceptable sleep patterns, and schools and workplaces rarely tolerate chronically late, absent, or sleepy students and workers, failing to see them as having a chronic illness. By the time DSPD sufferers receive an accurate diagnosis, they often have been misdiagnosed or labelled as lazy and incompetent workers or students for years. Misdiagnosis of circadian rhythm sleep disorders as psychiatric conditions causes considerable distress to patients and their families, and leads to some patients being inappropriately prescribed psychoactive drugs. For many patients, diagnosis of DSPD is itself a life-changing breakthrough. As DSPD is so little-known and so misunderstood, peer support may be important for information, self-acceptance, and future research studies. People with DSPD who force themselves to follow a normal 9–5 workday "are not often successful and may develop physical and psychological complaints during waking hours, e.g., sleepiness, fatigue, headache, decreased appetite, or depressed mood. Patients with circadian rhythm sleep disorders often have difficulty maintaining ordinary social lives, and some of them lose their jobs or fail to attend school." There have been several studies that have attempted to estimate the prevalence of DSPD. Results vary due to differences in methods of data collection and diagnostic criteria. A particular issue is where to draw the line between extreme evening chronotypes and clinical DSPD. Using the ICSD-1 diagnostic criteria (current edition ICSD-3) a study by telephone questionnaire in 1993 of 7,700 randomly selected adults (aged 18–67) in Norway estimated the prevalence of DSPD at 0.17%. A similar study in 1999 of 1,525 adults (aged 15–59) in Japan estimated its prevalence at 0.13%. A somewhat higher prevalence of 0.7% was found in a 1995 San Diego study. A 2014 study of 9100 New Zealand adults (age 20–59) using a modified version of the Munich Chronotype Questionnaire found a DSPD prevalence of 1.5% to 8.9% depending on the strictness of the definition used. A 2002 study of older adults (age 40–65) in San Diego found 3.1% had complaints of difficulty falling asleep at night and waking in the morning, but did not apply formal diagnostic criteria. Actimetry readings showed only a small proportion of this sample had delays of sleep timing. A marked delay of sleep patterns is a normal feature of the development of adolescent humans. According to Mary Carskadon, both circadian phase and homeostasis (the accumulation of sleep pressure during the wake period) contribute to a DSPD-like condition in post-pubertal as compared to pre-pubertal youngsters. Adolescent sleep phase delay "is present both across cultures and across mammalian species" and "it seems to be related to pubertal stage rather than age." As a result diagnosable DSPD is much more prevalent among adolescents. with estimates ranging from 3.4% to 8.4% among high school students. ^ Hirshkowitz, Max (2004). "Neuropsychiatric Aspects of Sleep and Sleep Disorders". In Yudofsky, Stuart C.; Hales, Robert E. Essentials of neuropsychiatry and clinical neurosciences (4th ed.). Arlington, Virginia: American Psychiatric Publishing. pp. 324–325. ISBN 978-1-58562-005-0. Individuals with delayed sleep phase are more alert in the evening and early nighttime, stay up later, and are more tired in the morning. ^ Micic G, de Bruyn A, Lovato N, Wright H, Gradisar M, Ferguson S, Burgess HJ, Lack L (2013). "The endogenous circadian temperature period length (tau) in delayed sleep phase disorder compared to good sleepers". J Sleep Res. 22 (6): 617–624. doi:10.1111/jsr.12072. PMID 23899423. ^ a b "Delayed Sleep Phase Syndrome (DSPS)". Cleveland Clinic. Retrieved 13 March 2015. ^ a b Patke, Alina; Murphy, Patricia J.; Onat, Onur Emre; Krieger, Ana C.; Özçelik, Tayfun; Campbell, Scott S.; Young, Michael W. (2017-04-06). "Mutation of the Human Circadian Clock Gene CRY1 in Familial Delayed Sleep Phase Disorder". Cell. 169 (2): 203–215.e13. doi:10.1016/j.cell.2017.03.027. ISSN 1097-4172. PMC 5479574. PMID 28388406. ^ Dagan Y, Eisenstein M (1999). "Circadian rhythm sleep disorders: toward a more precise definition and diagnosis". Chronobiol. Int. 16 (2): 213–222. doi:10.3109/07420529909019087. PMID 10219492. ^ a b Schrader, H; Bovim, G; Sand, T (1993). "The prevalence of delayed and advanced sleep phase syndromes". Journal of Sleep Research. 2 (1): 51–55. doi:10.1111/j.1365-2869.1993.tb00061.x. PMID 10607071. ^ a b Yazaki, M.; Shirakawa, S.; Okawa, M.; Takahashi, K. (1999). "Demography of sleep disturbances associated with circadian rhythm disorders in Japan". Psychiatry and Clinical Neurosciences. 53 (2): 267–268. doi:10.1046/j.1440-1819.1999.00533.x. PMID 10459707. ^ Weitzman ED, Czeisler CA, Coleman RM, et al. (1981). "Delayed sleep phase syndrome. A chronobiological disorder with sleep-onset insomnia". Arch. Gen. Psychiatry. 38 (7): 737–746. doi:10.1001/archpsyc.1981.01780320017001. PMID 7247637. ^ "Sleeplessness and Circadian Rhythm Disorder". eMedicine World Medical Library from WebMD. Retrieved 2006-06-04. Implicit in the diagnosis of circadian rhythm disorder is a desire to conform to traditionally accepted sleep–wake patterns. ^ Dagan Y (2002). "Circadian rhythm sleep disorders (CRSD)" (PDF). Sleep Med Rev. 6 (1): 45–54. doi:10.1053/smrv.2001.0190. PMID 12531141. Archived from the original (PDF: full text) on 27 February 2008. Retrieved 8 November 2007. Early onset of CRSD, the ease of diagnosis, the high frequency of misdiagnosis and erroneous treatment, the potentially harmful psychological and adjustment consequences, and the availability of promising treatments, all indicate the importance of greater awareness of these disorders. ^ a b c American Academy of Sleep Medicine (2001). The International Classification of Sleep Disorders, Revised (ICSD-R) (PDF). ISBN 978-0-9657220-1-8. Archived from the original (PDF) on 26 July 2011. ^ Kripke, Daniel F.; Rex K.M. ; Ancoli-Israel S.; Nievergelt C.M. ; Klimecki W.; Kelsoe J.R. (April 2008). "Delayed sleep phase cases and controls" (PDF). Journal of Circadian Rhythms. 6 (1): 6. doi:10.1186/1740-3391-6-6. PMC 2391143. PMID 18445295. Archived from the original (PDF: full text) on 23 July 2008. Retrieved 2008-05-01. ^ Terman, Michael (19 April 2010). "Sleeping (or Not) by the Wrong Clock". New York Times. ^ Kissling C, Retz W, Wiemann S, Coogan AN, Clement RM, Hünnerkopf R, Conner AC, Freitag CM, Rösler M, Thome J (5 April 2008). "A polymorphism at the 3′-untranslated region of the CLOCK gene is associated with adult attention-deficit hyperactivity disorder". American Journal of Medical Genetics Part B. 147B (3): 333–338. doi:10.1002/ajmg.b.30602. PMID 17948273. ^ Van der Heijden KB, Smits MG, Van Someren EJ, Gunning WB (2005). "Idiopathic chronic sleep onset insomnia in attention-deficit/hyperactivity disorder: a circadian rhythm sleep disorder". Chronobiology International. 22 (3): 559–570. doi:10.1081/CBI-200062410. PMID 16076654. ^ Aoki H, Ozeki Y, Yamada N (March 2001). "Hypersensitivity of melatonin suppression in response to light in patients with delayed sleep phase syndrome". Chronobiol. Int. 18 (2): 263–271. doi:10.1081/CBI-100103190. PMID 11379666. Our findings therefore suggest that evening light restriction is important for preventing patients with DSPS from developing a sleep phase delay. ^ Billiard, Michel; Kent, Angela (2003). Sleep: Physiology, Investigations and Medicine. New York: Springer. pp. 495–497. ISBN 978-0-306-47406-4. Retrieved 2015-05-05. ^ Uchiyama M, Okawa M, Shibui K, et al. (1999). "Poor recovery sleep after sleep deprivation in delayed sleep phase syndrome". Psychiatry Clin. Neurosci. 53 (2): 195–197. doi:10.1046/j.1440-1819.1999.00481.x. PMID 10459687. ^ Ancoli-Israel S, Schnierow B, Kelsoe J, Fink R (2001). "A pedigree of one family with delayed sleep phase syndrome". Chronobiol. Int. 18 (5): 831–840. doi:10.1081/CBI-100107518. PMID 11763990. ^ Archer SN, Robilliard DL, Skene DJ, Smits M, Williams A, Arendt J, von Schantz M (June 2003). "A length polymorphism in the circadian clock gene Per3 is linked to delayed sleep phase syndrome and extreme diurnal preference". Sleep. 26 (4): 413–415. doi:10.1093/sleep/26.4.413. PMID 12841365. ^ Nadkarni NA, Weale ME, von Schantz M, Thomas MG (2005). "Evolution of a length polymorphism in the human PER3 gene, a component of the circadian system". J. Biol. Rhythms. 20 (6): 490–499. CiteSeerX 10.1.1.624.8177. doi:10.1177/0748730405281332. PMID 16275768. ^ Boivin DB, James FO, Santo JB, Caliyurt O, Chalk C (2003). "Non-24-hour sleep–wake syndrome following a car accident". Neurology. 60 (11): 1841–1843. doi:10.1212/01.WNL.0000061482.24750.7C. PMID 12796546. ^ Quinto C, Gellido C, Chokroverty S, Masdeu J (2000). "Posttraumatic delayed sleep phase syndrome". Neurology. 54 (1): 250–252. doi:10.1212/wnl.54.1.250. PMID 10636163. ^ Stores G (2003). "Misdiagnosing sleep disorders as primary psychiatric conditions". Advances in Psychiatric Treatment. 9 (1): 69–77. doi:10.1192/apt.9.1.69. * Stores G (2007). "Clinical diagnosis and misdiagnosis of sleep disorders". J. Neurol. Neurosurg. Psychiatry. 78 (12): 1293–1297. doi:10.1136/jnnp.2006.111179. PMC 2095611. PMID 18024690. ^ Dagan Y, Ayalon L (2005). "Case study: psychiatric misdiagnosis of non-24-hours sleep–wake schedule disorder resolved by melatonin". J Am Acad Child Adolesc Psychiatry. 44 (12): 1271–1275. doi:10.1097/01.chi.0000181040.83465.48. PMID 16292119. ^ a b American Academy of Sleep Medicine (2014). The International Classification of Sleep Disorders, Third Edition (ICSD-3). ISBN 978-0-9915434-1-0. ^ Kansagra, Sujay (13 July 2014). "Delayed sleep-wake phase disorder". MedLink Neurology. Retrieved 19 September 2015. ^ Dodson, Ehren R.; Zee, Phyllis C. (2010). "Therapeutics for Circadian Rhythm Sleep Disorders". Sleep Medicine Clinics. 5 (4): 701–715. doi:10.1016/j.jsmc.2010.08.001. PMC 3020104. PMID 21243069. ^ Phelps, J. (2008). "Dark therapy for bipolar disorder using amber lenses for blue light blockade". Med. Hypotheses. 70 (2): 224–229. doi:10.1016/j.mehy.2007.05.026. PMID 17637502. ^ Berson, M. (August 2007). "Phototransduction in ganglion-cell photoreceptors". Pflügers Archiv: European Journal of Physiology. 454 (5): 849–855. doi:10.1007/s00424-007-0242-2. ISSN 0031-6768. PMID 17351786. ^ Brainard GC, Hanifin JP, Greeson JM, Byrne B, Glickman G, Gerner E, Rollag MD (August 2001). 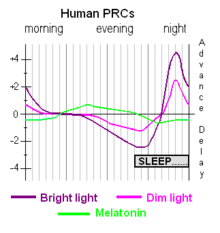 "Action spectrum for melatonin regulation in humans: evidence for a novel circadian photoreceptor". J. Neurosci. 21 (16): 6405–6412. doi:10.1523/JNEUROSCI.21-16-06405.2001. PMID 11487664. ^ Morgenthaler, TI; Lee-Chiong T; Alessi C; Friedman L; Aurora N; Boehlecke B; Brown T; Chesson AL; Kapur V; Maganti R; Owens J; Pancer J; Swick TJ; Zak R (November 2007). "Practice Parameters for the Clinical Evaluation and Treatment of Circadian Rhythm Sleep Disorders". Sleep. 30 (11): 1445–1459. doi:10.1093/sleep/30.11.1445. PMC 2082098. PMID 18041479. ^ Thorpy MJ, Korman E, Spielman AJ, Glovinsky PB (1988). "Delayed sleep phase syndrome in adolescents". J Adolesc Health Care. 9 (1): 22–27. doi:10.1016/0197-0070(88)90014-9. PMID 3335467. ^ Mosendane, Thabo; Mosendane, Tshinakaho; Raal, Frederick J (2008). "Shift work and its effects on the cardiovascular system". Cardiovasc J Afr. 19 (4): 210–215. PMC 3971766. PMID 18776968. Non-photic stimuli such as scheduled voluntary exercise, food, exogenous melatonin or serotonergic activation are also capable of shifting the endogenous circadian rhythms. ^ Mundey, K; Benloucif S; Harsanyi K; Dubocovich ML; Zee PC (October 2005). "Phase-dependent treatment of delayed sleep phase syndrome with melatonin". Sleep. 28 (10): 1214–1216. doi:10.1093/sleep/28.10.1214. PMID 16295212. ^ Lewy AJ, Emens JS, Sack RL, Hasler BP, Bernert RA (2002). "Low, but not high, doses of melatonin entrained a free-running blind person with a long circadian period". Chronobiol Int. 19 (3): 649–658. doi:10.1081/CBI-120004546. PMID 12069043. ^ Buscemi N., Vandermeer B., Pandya R., et al. Melatonin for Treatment of Sleep Disorders. Evidence Report/Technology Assessment: Number 108. AHRQ Publication Number 05-E002-1, November 2004. Agency for Healthcare Research and Quality, Rockville, MD. ^ DARE Review: A systematic review of the effectiveness of oral melatonin for adults (18 to 65 years) with delayed sleep phase syndrome and adults (18 to 65 years) with primary insomnia. Centre for Reviews and Dissemination. 2008. ^ "Provigil: Full Prescribing Information" (PDF). Teva Pharmaceuticals. 2015. Archived from the original (PDF) on 1 May 2015. Retrieved 7 May 2015. ^ Sack RL, Auckley D, Auger RR, et al. (2007). "Circadian rhythm sleep disorders: part II, advanced sleep phase disorder, delayed sleep phase disorder, free-running disorder, and irregular sleep–wake rhythm. An American Academy of Sleep Medicine review" (PDF: full text). Sleep. 30 (11): 1484–1501. doi:10.1093/sleep/30.11.1484. PMC 2082099. PMID 18041481. ^ Dagan Y, Yovel I, Hallis D, Eisenstein M, Raichik I (1998). "Evaluating the role of melatonin in the long-term treatment of delayed sleep phase syndrome (DSPS)". Chronobiol. Int. 15 (2): 181–190. doi:10.3109/07420529808998682. PMID 9562922. ^ Torpey, Elka (October 2015). "Careers for night owls and early birds". U.S. Bureau of Labor Statistics. Retrieved 2016-10-10. ^ a b c Dagan Y, Abadi J (2001). "Sleep–wake schedule disorder disability: a lifelong untreatable pathology of the circadian time structure". Chronobiol. Int. 18 (6): 1019–1027. doi:10.1081/CBI-100107975. PMID 11777076. ^ "You may need to offer flex schedule as ADA accommodation". Business Management Daily. 1 November 2003. ^ "Americans with Disabilities Act of 1990". Retrieved 2010-01-20. ^ Potts, Henry W.W. (2005). "Online support groups: An overlooked resource for patients" (PDF). University College London. Archived from the original (PDF: full text) on 30 April 2015. Retrieved 2008-04-14. ^ "Niteowl – Delayed Sleep Phase list". Retrieved 2015-04-30. ^ "Circadian Sleep Disorders Network". Retrieved 2016-04-27. ^ a b Nesbitt, Alexander D. (2018). "Delayed sleep-wake phase disorder". Journal of Thoracic Disease. 10 (Suppl 1): S103–S111. doi:10.21037/jtd.2018.01.11. PMC 5803043. PMID 29445534. ^ Paine, SJ; Fink, J; Gander, PH; Warman, GR. (2014). "Identifying advanced and delayed sleep phase disorders in the general population: a national survey of New Zealand adults". Chronobiology International. 31 (5): 627–636. doi:10.3109/07420528.2014.885036. PMID 24548144. ^ Ando, K; Kripke, DF; Ancoli-Israel, S (2002). "Delayed and advanced sleep phase symptoms". The Israel Journal of Psychiatry and Related Sciences. 39 (1): 11–18. PMID 12013705. ^ Carskadon, Mary A. (May 2008). "Circadian and Homeostatic Regulation of Sleep in Adolescent Humans" (PDF). Society for Research on Biological Rhythms. p. 44. Retrieved 2015-05-05. ^ Danielsson, K; Markström, A; Broman, J-E; von Knorring, L; Jansson-Fröjmark, M (2016). "Delayed sleep phase disorder in a Swedish cohort of adolescents and young adults: Prevalence and associated factors". Chronobiology International. 33 (10): 1331–1339. doi:10.1080/07420528.2016.1217002. PMID 27537980.